Eva Mae Smith 87, of Town Creek died Wednesday, Oct 10th at Hospice Family Care Facility. Her funeral will be Sunday October 14th at Little Star Cumberland Presbyterian Church of America in Town Creek at 1 PM. Burial will follow at New Life Cemetery. There will be public viewing on Saturday form 11-5 followed by visitation from 5-7 here at Jackson Memory Funeral Home. Mrs. Eva Mae Smith was born July 03, 1931. She was the daughter of the late Saul and Mattie Madden. She departed this earthly life Wednesday, October 10, 2018, at Huntsville Hospice Family Care surrounded by her loving family. Eva confessed hope in Christ at an early age and joined Fellowship Jerusalem Primitive Baptist Church. She later moved her membership to Little Star Cumberland Presbyterian Church in America. During her faithful membership, she served as a mother, Sunday School Treasurer, and a choir member until her passing. She loved the Lord, her family, church family, neighbors, and friends. On September 29, 1951, Eva Mae Madden and Nathaniel Smith were united in Holy Matrimony. To this union of 65 years, eight children were born. She is preceded in death by her parents; Saul and Mattie Madden, her loving husband; Nathaniel “Doc” Smith, sisters; Pearletta Owens Smith, Betty Smith, Lucille Shackleford, Cynthia Marie Watkins, and one brother; Johnny L. Madden. 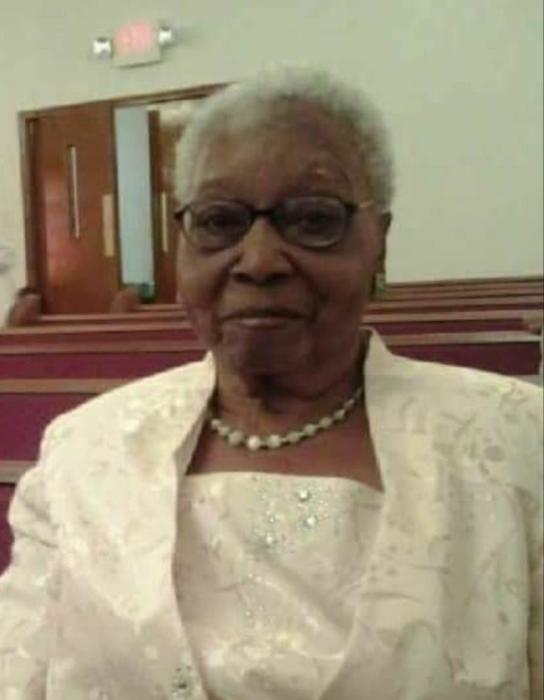 She leaves to cherish her memory: her ten children; Eunice Jones (Johnny) of Hartselle, AL, Willinetta Mason of Hillsboro, AL, Harry Smith (Vera) of Decatur, AL, Lilian Shackleford-Gholston (Hubert) of Hillsboro, AL, Cynthia M. Robinson (JC), Pearl Bevels (Alfonso) and Jeanetta Booker (Samuel) of Decatur, AL; and Robert Smith (Dionna) of Hillsboro, AL, Julia Pointer of Hillsboro, AL, and Shameka Pointer of Atlanta, GA; seventeen faithful grandchildren, fifteen great-grandchildren, and three great-greatgrandchildren, one sister; Susie Johnson of Hillsboro, AL. She also leaves behind sisters-in-law; Lillian White of Decatur, AL, Mary Allen (Franklin) of Tuscumbia, AL; brothers-in-law; George Smith and James Smith, Jr., (Louise) of Trinity, AL; a host of devoted nieces, nephews, cousins, and a special caring neighbor, Mother Winnie Sanford. Special thanks to her caregivers; Ms. Shirley Woods, Ms. Clara Smith, Ms. Ann Polly, Dr. Baggett, and Huntsville Hospice Family Care Staff.